All submissions will be considered by a jury made up of Friends of Magnolia Park committee members. We will accept 20 submissions for review, so get yours in early! All musicians will be notified by May 15th. After the bands have been selected and finalized, a general overall music series flyer will be shared with the bands to be reviewed and approved for final distribution. Use the exhibit space at the former Sunbug Solar (1319 Mass Ave) to display your work. Successful proposals may include any artistic medium including installation, painting, sculpture, photography, light and sound, as well as poetry or prose (for example, part of a poem or essay that is enlarged and cut out of adhesive vinyl and placed on window front). We are looking for displays that can be read from a distance as well as close up, that are visually exciting, and that show both sophistication and appropriateness for the location. To submit your proposal, or for more information, contact Ali Carter, Economic Development Coordinator at acarter@town.arlington.ma.us or 781-316-3095. 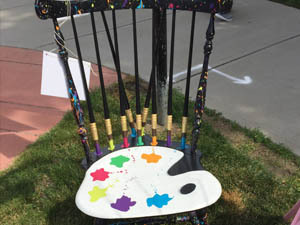 DEADLINE FOR SUBMISSIONS IS MAY 31, 2019 AT 5 P.M.
Chairful Where You Sit is a temporary outdoor art installation and fundraiser for Arlington Public Art featuring reimagined chairs. We invite you to find an old chair and creatively transform it. Images from previous years’ Chairful events. This year’s event will take place on June 8 from 11 to 6 pm, concurrent with the ACA’s event, Porchfest, and will be held at Uncle Sam Plaza across from Whittemore Park in Arlington Center. In keeping with Chairful’s commitment to upcycling orphan chairs, our theme this year is SUSTAINABILITY: FLORA AND FAUNA. Adults and older teens. Ages 14 and under may participate only with an adult partner. All entries will be accepted. All chairs will be available for purchase by the public for a donation of $100 and will support Arlington Public Art’s programs. Artists may request a percentage of the purchase price or may donate the full sale amount to APA. Applications are $10 per chair. To apply, please use the Town of Arlington online portal. Something missing? Submit a Call for Artists using this form and we’ll get it added to the site!